Today is Melanoma Monday. While that kind of sounds like a melancholy way to kick off the month of May, it's part of Skin Cancer Awareness Month, and it's a good reminder to focus on prevention and taking care of your health. As some of you may know, I was diagnosed earlier this year with melanoma. Skin cancer runs in my family, but it was carcinoma, which is less deadly than melanoma. Still, I knew to be vigilant and keep an eye on my skin, because I have several risk factors for skin cancer: family history, pale skin and light eyes, lots of moles, and sun exposure and sunburn as a child. I avoid the sun now and always use sunscreen, but when I was growing up in Arizona I rarely did, and I also tried tanning beds when I was in junior high because I got teased so much for being pale. (They didn't work; I just burn and go right back to pasty white.) I get annual mole checks by a dermatologist, and I know that if I see a change in a mole, I should go directly to the doctor. That's what happened with the mole that turned out to be melanoma. There are photographs and examples at the link above, but my mole didn't look anything like them. The key was that last item - evolving - because the mole, which had been the same my entire life, started changing. The first thing it did was get kind of dry and flaky, so I went to the dermatologist, who took a photo of it and told me to come back in 3 months so she could compare it and see if it had changed. A month later I noticed that it had lost color in the center, so I went right back to her and she removed it. The lab confirmed melanoma shortly afterward. I was very fortunate to have caught it so early. My melanoma was Stage 0, melanoma in situ, which means the cancerous cells were contained entirely in the epidermis. Still, to be safe, a surgeon needed to remove tissue around it, down to the fat layer, to make sure it hadn't moved beyond that. Fortunately, the margins came back clean, and I am cancer-free (with a pretty badass scar). But since I have prior history of melanoma, I need to be even more vigilant because that diagnosis means I'm at a higher risk of developing melanoma again in the future. There are a lot of things you can do to help prevent skin cancer. The best way to do this is to limit your exposure to UV light - wear a hat, seek shade, avoid being in direct sunlight when the sun's rays are strongest (10AM - 4PM, generally speaking). Use a broad-spectrum sunscreen that protects from UVA and UVB rays. And get regular skin checks by a dermatologist if you have any of the major risk factors. I'm glad I did. My husband as art, originally uploaded by kmcgivney. Last week, my husband, my partners in Hanne Apparel, and a few of our muses went to GMHC's third annual Fashion Forward event. This was our second year attending and sponsoring, and we had a fantastic time! 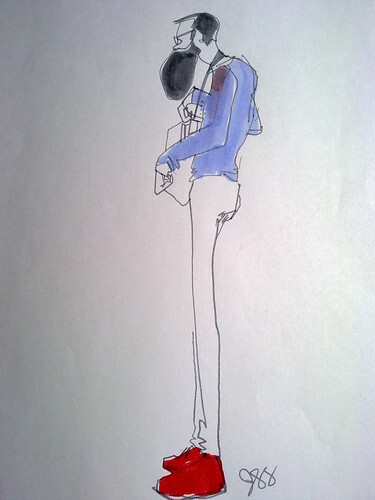 One of the highlights this year for us were the fashion students walking around the party sketching the attendees. We bought a couple of the sketches - one of my daughter, and another one of an anonymous fabulous fashionista, but missed out on this one during the event. Fortunately, my husband is fairly recognizable, and one of the event organizers saw this sketch of him after the event and sent it to us. I love it! I especially love how the artist captured his favorite new red shoes. I'll be back to my semi-regular schedule of posting recipes, travel photos, and the occasional technology rant shortly. In the meantime, if you're in the NYC area, we're looking for some more authors at the NYC Metblog, so if you want to write about NYC, post a comment over there and let us know! It's the end of the year, therefore it is time for all bloggers to get all introspective and do a "year in review" post. (It's in the blogging bylaws. Look it up.) As many of you know, 2008 was a rather eventful year for me. I got married, left IBM, started two companies, traveled a lot, renewed an interest in cooking, and became a well-versed patient advocate for my father. I feel like 2008 flew by in a blur of sometimes awesome, sometimes difficult, but always incredible occurrences and learning experiences. I thought about how I'd try to sum up all of these things that have happened in my life in 2008, and realized that it would have to be an incredibly long blog post if I wanted to do most of these topics any justice. Instead, I decided to do a summary in a convenient bulleted list, followed by some of my favorite photos from 2008 after the jump. Sometimes it's easier to tell stories through images. Note: It was hard to pick just these images, since there were so many more that I loved this year, but if I included them all it'd take 15 years to load the page. So I picked a handful of highlights. Flew 109,753 miles total, 103,105 on American, 6,648 on JetBlue. Closed second-largest deal in Lotus history in June. Founded Sakura Consulting in July. Launched Hanne Apparel in November. Photographs published on Premiere.com in several articles in the summer. Got married to the most wonderful man I know on April 12, 2008. Plenty of other stuff happened, but that is the most important! All in all, it's been a bit of a rollercoaster, but at least it's been interesting! After the new year, I'll be posting a lot more about what's going on at Sakura Consulting and what I'll be doing at Lotusphere. But for now, enjoy some photos of these and various other highlights of 2008 after the jump. I'd like to take this opportunity to apologize to the three readers who still have this blog in their RSS feeds for my unexplained radio silence recently. Actually, 2 1/2 of you know what's going on because I talk to you on a regular basis, but anyway, I figured I should tell the rest of the internets what is going on in my personal life, because that's what blogs are for! Inappropriate sharing! My dad fell ill right after we came back from Boston. (Personally, I blame the monkey in the last post.) I've been in upstate NY most of the time since then tending to my dad's medical, personal, household, and financial needs. He's out of the hospital now and out of immediate danger, but he has been diagnosed with several very serious conditions that will require ongoing treatment. Until I get a regular schedule set up with him with visiting nurses, family, and friends, I will be up here every week making sure he goes to his appointments and takes his medications. Unfortunately, that means I won't be going to UKLUG. I was really looking forward to presenting, introducing my new consulting company to everyone, and reconnecting with all my colleagues and friends from the UK and the rest of Europe, but my father takes precedent. I'll just have to wait to see you all at Lotusphere! The good news is that we're out of the woods for now, so I can resume a somewhat regular schedule of blogging, baking, photographing, and otherwise wreaking havoc on the world around me. Next week I'm bringing a couple of cameras so I can document the changing fall colors and my dad's beautiful flower and vegetable garden, so you can expect a few new posts in the near future with pretty pictures. For now, following me on Twitter to keep up with daily happenings is your best bet (if you're into that sort of thing). Anyone following me on Twitter will know that I went to the hospital this morning for some minor outpatient surgery. It wasn't a major procedure, but invasive enough that they had to give me general anesthesia. I was actually more nervous about the anesthesia than the surgery itself, because I had never undergone general before. I got some reassurances from a couple of friends who had had it before, but I was still a bit nervous. The staff at the hospital was quite nice and understanding and they did a great job reassuring me and keeping me as calm as possible, given the circumstances. I'm home now, and I don't feel the least bit groggy or sluggish, just kind of sore in the surgery area (which is, of course, to be expected). So, all is well. Thanks to my friends for the good thoughts via text, email, and Twitter! And thanks to Twitter for not giving us the fail-whale this morning. In the past couple of years, I've been through a series of changes both big and small - moving back to New York City, getting married, changing blogs. Today brings another in that series of changes, as it is my last day with IBM. I'm both excited for what lies ahead and sad to leave such a wonderful group of colleagues. I've had the great fortune to work with some of the best and brightest within IBM and Lotus. I truly value the time I've spent at IBM/Lotus and am very thankful for the amazing colleagues and friends I've come to know during my time there. And I don't expect those relationships to change - though I'm leaving the company, I'm certainly not leaving the Lotus community. My decision was not one I took lightly. For the past couple of years, I have often had thoughts of changing focus - taking some time to explore my interests outside of IT and explore new possibilities. I've been very fortunate that I've been able to explore two of my passions while working as an IBMer: travel and photography (and sometimes, a combination of the two). I've found, however, that I'd like to explore that creative side a bit more, so I'll be devoting more time to photography, and will be going back to school for photography and fine art. But as I said, I won't be leaving the Lotus community. I've started my own consulting company, Sakura Consulting, and will be providing consulting services for an array of Lotus products. I'll also continue to speak at conferences and user groups. In fact, I'll be presenting at the UK Lotus User Group meeting in September. I want to thank my manager and my colleagues and mentors that supported me as I made this difficult decision. I also want to thank all of the friends and colleagues I've met and worked with via the Lotus community over the years. I encourage you to keep in touch, whether it be by blogging, e-mail, Twitter, or just saying hi when we cross paths at a conference. I've got so many great memories of the people in the Lotus community, and I can't wait to see the new ones that are to come.